Will fairy tales live happily ever after in the digital publishing era? Once upon a time, electronic signatures didn’t designate us as individuals, passwords didn’t determine if we would be denied or not the access in data and emoticons didn’t constitute “the artificial warrant and guarantee of our human presence” (David Gunkel, Debra Hawhee – Virtual Alterity and the Reformatting of Ethics). Now, that all these have become a common place, a new debate has started with the e-books starting the digital party without inviting their written ancestors. Will the process of reading change forever? Are e-books destined to save books from extinction or do they chime the end of the printing era? Looking for an answer, I came across with this video of Alice in Wonderland iPad app. Stating an avowed book-lover myself, I couldn’t help smiling. Not just because I enjoyed the animated features, the amazing illustrations and the cheerful soundtrack, but also because I could see Alice saying again: “But it’s no use going back to yesterday, because I was a different person then.” Alice is right. She is not just Alice in Wonderland anymore. She is Alice in iPad as well. iPad is said to have changed the way we get informed, we look our photos, we experience the web, fitting “so many great ideas into something so thin” as Apple brags. To speak in fairy tale terms it’s like the oil lamp that once you rub it-or just touch it- your wishes will be fulfilled. 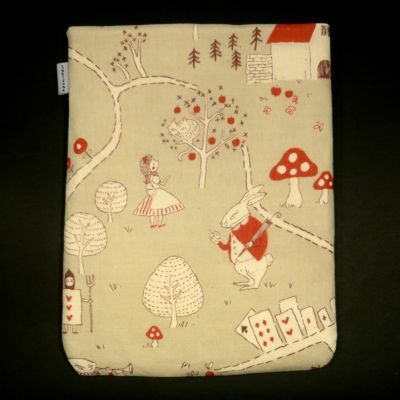 But what I wonder is can iPad do wonders for Alice in Wonderland and other fairy tales? In other words, can it keep the story telling going from generation to generation or is it going to set an unhappy ending to one of the most intimate experience humans share? Perhaps, my concern on the ongoing of fairy tales maybe sounds too romantic in an era where market shares matter the most. The thing is that I strongly believe that the malleable structure and the development of the plot of fairy tales leave space for experimentation. As Alice Abler put it in her article “The Moral of the Story”: “Between “once upon a time” and “happily ever after” lies a timeless, ever-changing world, where everything is possible and dreams do come true.” The way I see it experimentation might be the key for further improvement of e-books, so that we don’t have to think them as competitors to the “most beautifully engineered, and human-engineered, components in existence” (Licklider), the books. Another important feature of fairy tales is that they convey morals already built in the social context. They teach lessons related to family settings. They re-produce stereotypes. They reflect cultural influences. Thus, they constitute an integral part of daily life. They can’t afford to be outdated. They can’t afford not to be shared. And e-books can make them accessible to a far, far larger audience, eager to read and transform the story. That is if the giants (Apple, Amazon) let us have the control of the story. Victor Keegan in his article “The digital reading revolution” talks about “digital silos” that try to impose their rules about what we can read and where we can read it. And the most worrying part: “Some publishers even ask us to state that we won’t read the book aloud”. Honestly, can you imagine a fairy tale that can’t be read aloud? Well, fairy tales have already survived various transitions: from the oral culture to the written culture, from the dominancy of hand-written documents to the multiplication brought by typography, from the static written text to the moving image of the cinema. That’s why I’m pretty optimistic that they’ll make it this time too. And more than that they might show the way to the digitalization of the total of literary culture, without that meaning the extinction of the books as physical objects. « Print our own furniture?